WRIGHT/FENTON PUFFY ROSE 19 LAMP - 3 WAY - WHITE WHEN NOT LIT, PINK ROSE WHEN IT IS LIT. 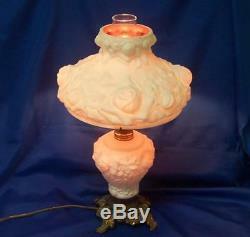 WRIGHT GLASS - "PUFFY ROSE" WHITE OVER PINK CASED 19 LAMP - 3 WAY. FENTON LG WRIGHT GLASS - "AMERICAN BEAUTY" STUDENT LAMP "WILD ROSE" WHITE OVER PINK CASED- 3 WAY - BRASS BASE. We are pleased to offer you this FENTON GLASS. MADE IN THE 1950'S. "AMERICAN BEAUTY" 19 STUDENT LAMP. WILD ROSE OVERLAY WHITE OVER DARK PINK THREE WAY LIGHT This Lamp is beautiful when turned off or on! It has a pure white exterior and a rose pink interior. The embossed roses are deep and detailed. The lamp is white when not turned on, and a pink rose color when turned on. It can be lit with top only, bottom only and top and bottom. The measurements are 19" tall to top of shade, 11" wide shade and a 9 1/2 fitter ring. It has a clear chimney. The base is brass and there is a small age stress in the metal, but the lamp sits straight and base is strong. Other than that, it is in excellent condition with no chips, cracks or damage and is in fine working condition. We try to take pictures from several angles and also offer a close-up feature so you can look carefully at the piece for yourself. We welcome any questions and thank you for viewing our item. We'd like to invite you to visit our store, Town Square Emporium! And be sure to check our feedback. We are very proud of it and we work hard every day to deserve it. Get images that make Supersized seem small. Tailor your auctions with Auctiva's. The item "FENTON LG WRIGHT GLASS AMERICAN BEAUTY LAMP- WHITE WILD ROSE OVERLAY PINK 1950" is in sale since Friday, March 30, 2018. This item is in the category "Pottery & Glass\Glass\Art Glass\North American\Fenton". The seller is "townsquaremike" and is located in Akron, Ohio. This item can be shipped worldwide.